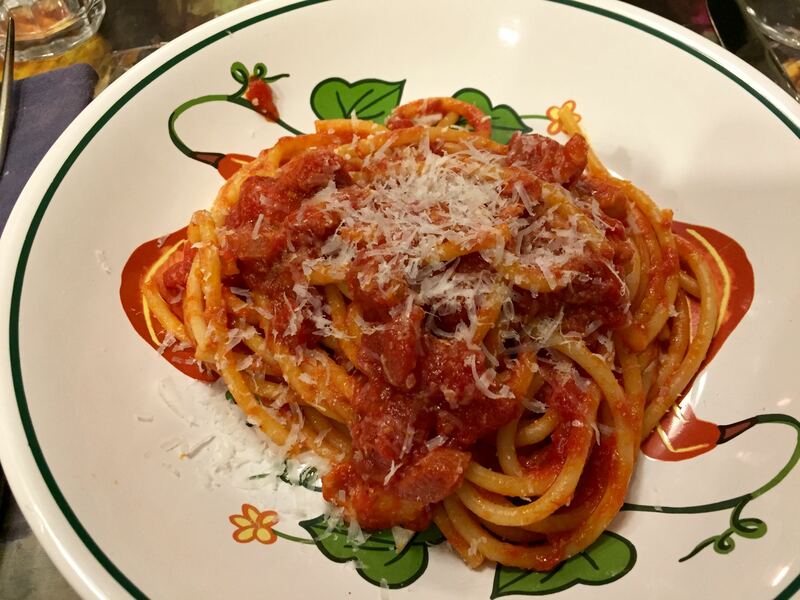 One of my all time favorite restaurants in Rome is La Matricianella, and one of my favorite Roman pastas is one of its specialties, bucatini all’Amatriciana, a dish that hails from a mountain town southeast of Rome, Amatrice. You may have read about this town a few years ago, when it was devastated by an earthquake in August of 2016. Among Roman chefs, however, there is some controversy over this dish related primarily to the use of onion and garlic. 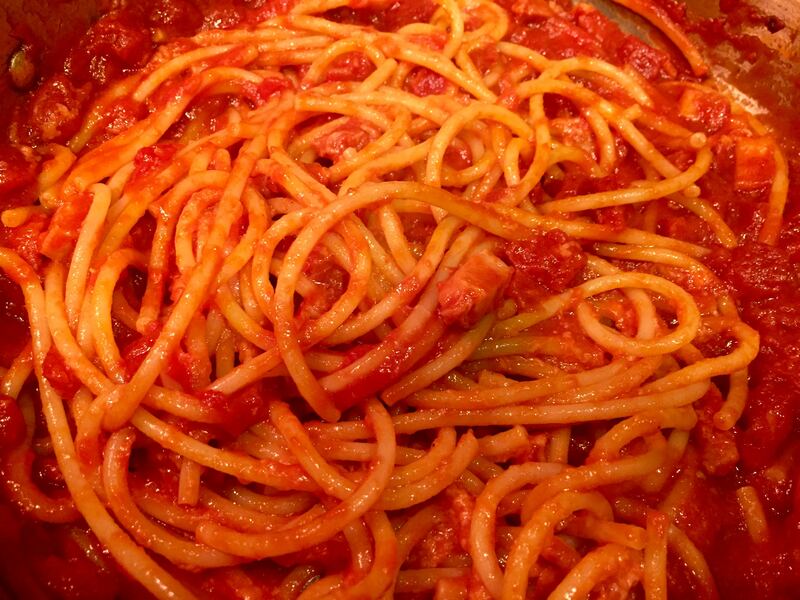 In fact, the city of Amatrice eventually issued guidelines for the dish that list the “official” ingredients: spaghetti, guanciale, extra-virgin olive oil, white wine, either fresh or canned tomatoes, hot chili pepper, freshly grated Pecorino Romano, and salt. The last time I wrote about this pasta here, I used a Marcella Hazan recipe, which I’m sure would rile many a purist by its use of onion, pancetta as opposed to guanciale, butter and vegetable oil, Parmesan, and bucatini. Yet despite the substitutions, perhaps even because of then, Hazan’s recipe yields a delicious dish. But last night I wanted to replicate, as closely as possible, the version I enjoy in Rome. La Matricianella does use bucatini; therefore, so did I. 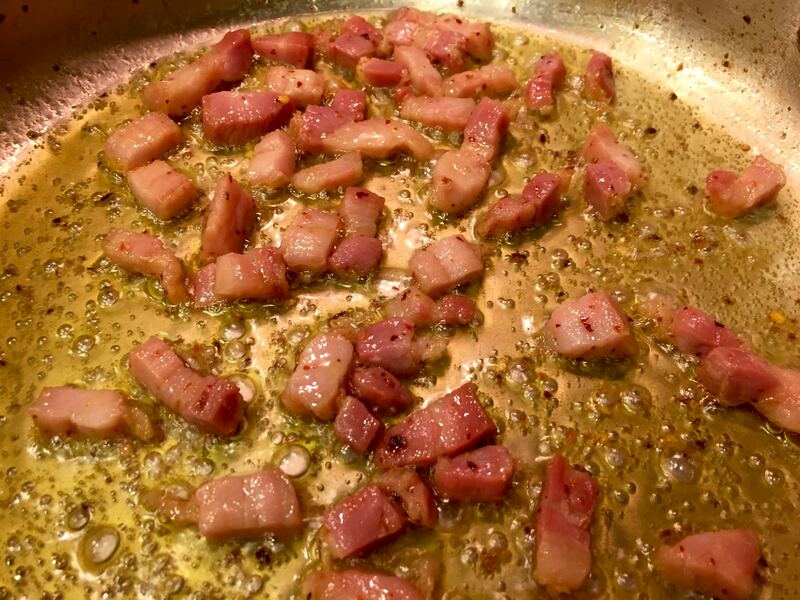 My only other variation from the official recipe as well as from Downie’s, was substituting pancetta for the guancialeI was unable to find a good piece of it here in San Diego. I also prefer having the pork for this dish in larger chunks than Downie’s “roughly-chopped” style, approximately 1/4” thick, 1/2” wide, and 1” long. 1. 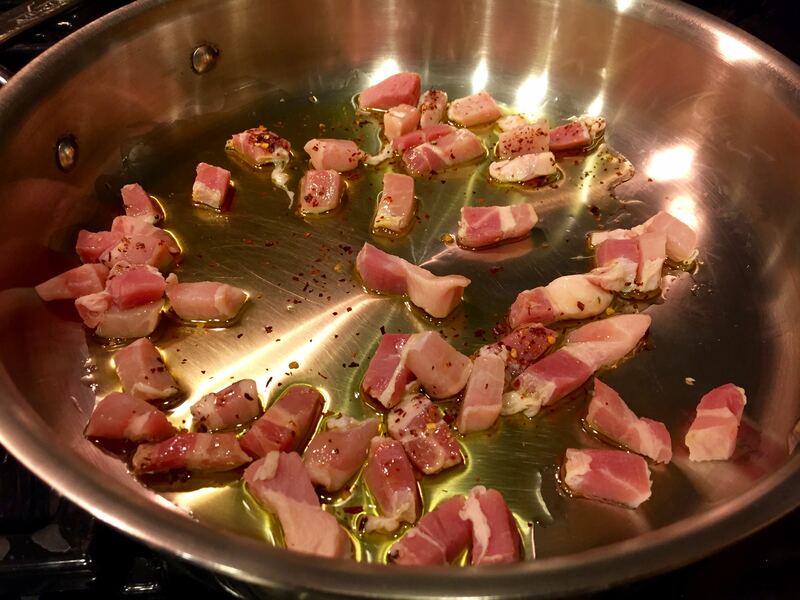 Cut the pancetta into chunks approximately 1/4” thick, 1/2” wide, and 1” long. 2. 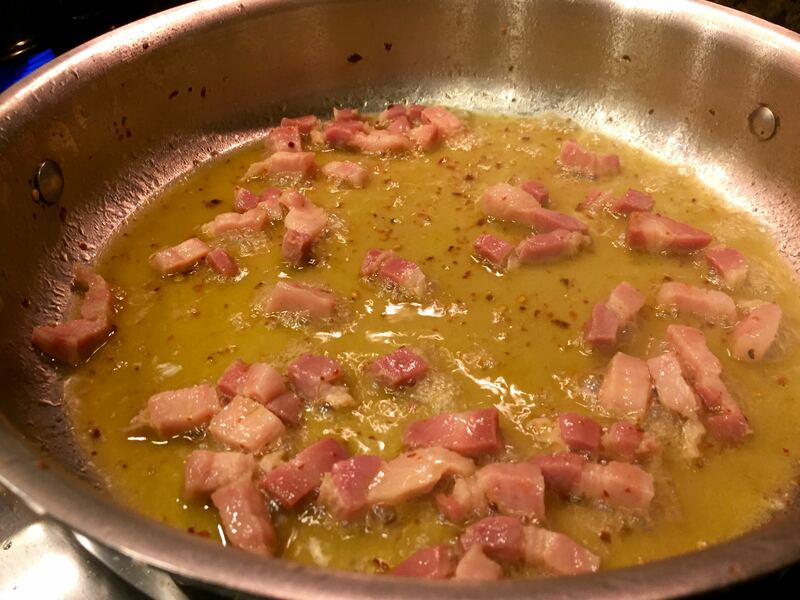 Scatter the pancetta around a thick bottomed, high-sided sauté pan/ Add the oil and the red pepper flakes. Sauté over high heat for 2 to 3 minutes to melt the pork fat, stirring with a wooden spoon or spatula. 3. Once the pancetta colors, but before it begins to crisp, pour in the wine and boil to evaporate it, about 2 minutes. 5. Bring at least 5 quarts of water to a boil in a large pot. Add a generous amount of salt Cook until the pasta is barely al dente, about 1 to 2 minutes less than the package’s suggested cooking time. 7. 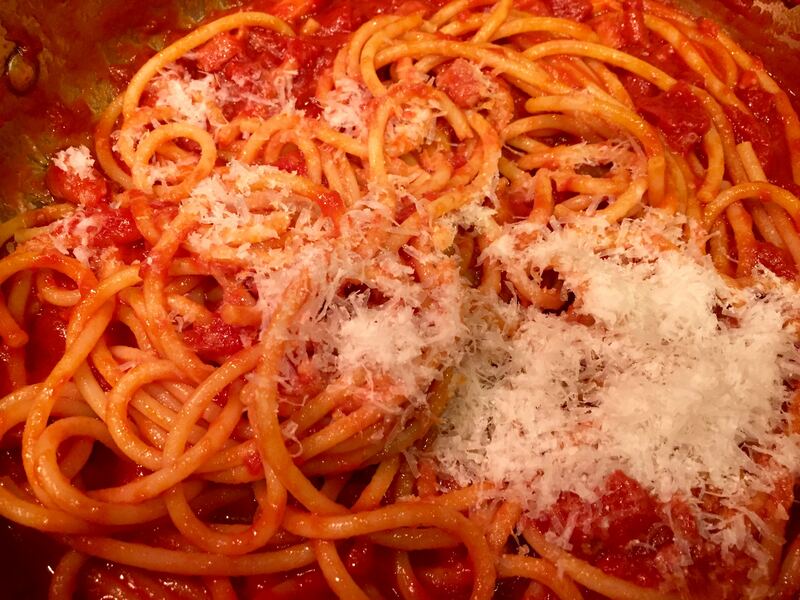 Serve immediately in heated pasta bowls, with the remaining Pecorino Romano on the side. This recipe serves at least four and when I’m cooking for two I’ll often make the full recipe to have enough sauce for another night. 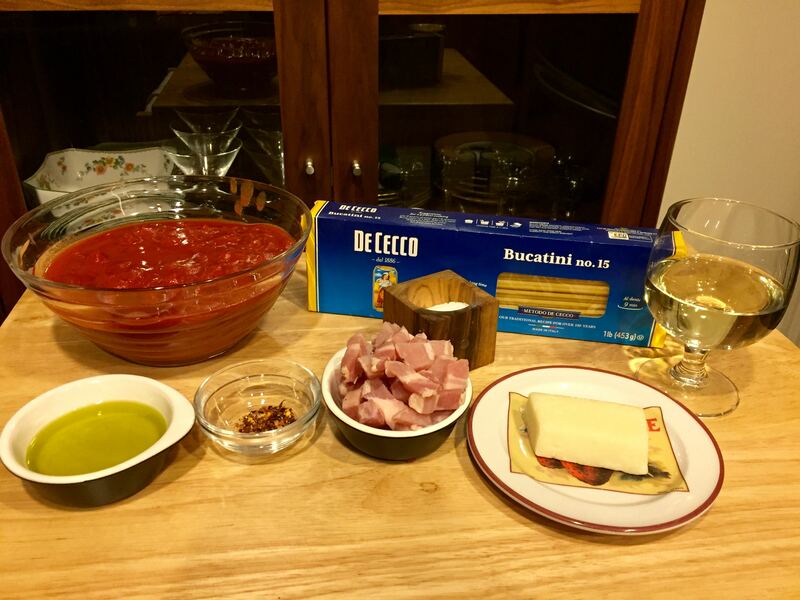 In fact, I may use the remaining sauce for an Amatriciana frittata as suggested by Downie. Next Article Musing: No Time To Cook? LOVE Matricianella. My wife liked Armando better, but it’s splitting hairs. I can’t find real guanciale either. It’s illegal in the US. My specialty shop gets a good one from Canada but it’s not the same. 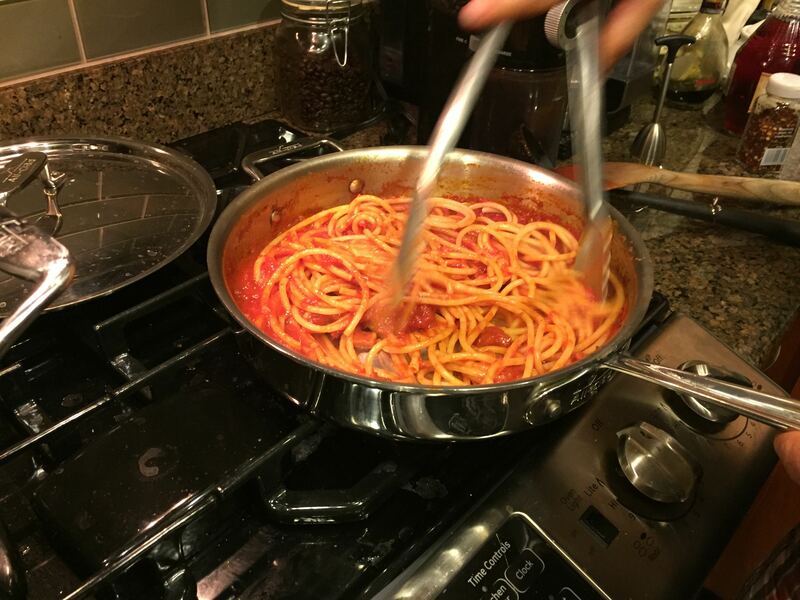 Never used white wine in mine, Amatriciana a favorite pasta or mine. Hazan baffles me with her use of butter. Her simple tomato sauce is ludicrous. I can’t stand that and don’t consider myself a purist at all. 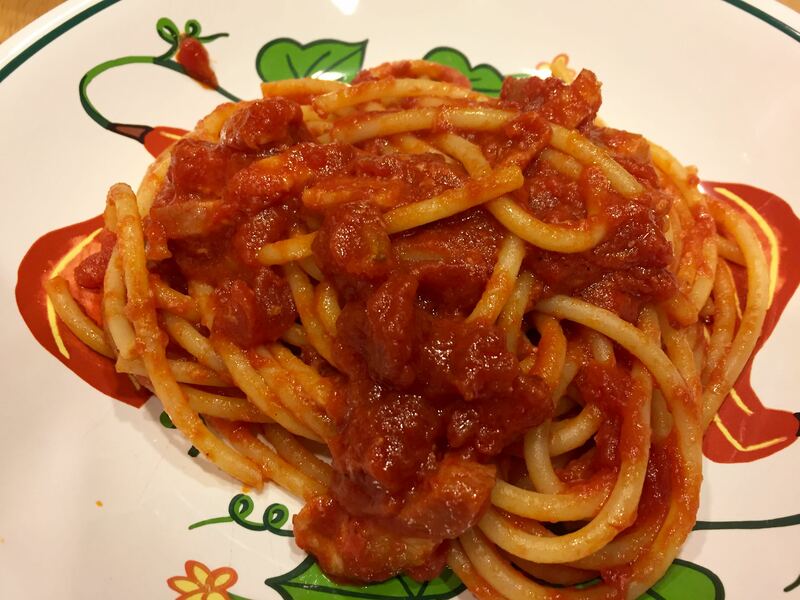 In fact, I like onion in Amatriciana but never garlic. Anyway, to each their own, but I don’t like Hazan at all. Thanks, John. I used to get some very good guanciale at Eataly as well as at Buon Italia in Chelsea Market. 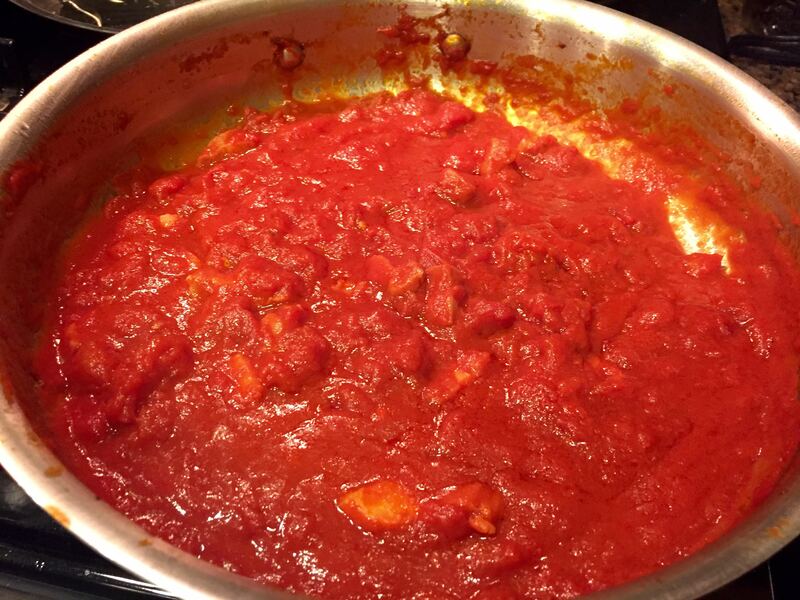 Although I use Hazan’s simple tomato sauce and occasionally reduce the butter, I still favor my Neapolitan aunt’s olive-oil based marinara.